JESS Conte may be living the Hollywood life in Los Angeles, but the internet star has not forgotten her formative years in Kingaroy. 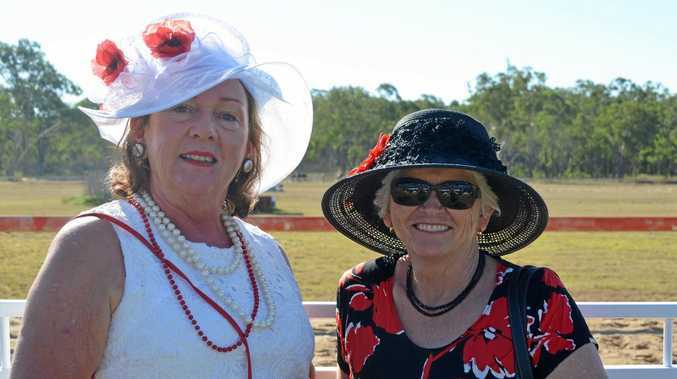 "I was pretty young when I lived there, but the memories I have of Kingaroy are mostly fun times with family or the friends that I made at Kingaroy State Primary," she said. Jess, whose maiden name was Bauer, was born in the town in 1996, where her father Russell Bauer taught music at Kingaroy State High School. "A huge part of our life when we lived there was Dad working at the high school with the bands, so I have a lot of memories surrounding the music of the high school and the touring the bands did," she said. Despite leaving the South Burnett town when she was eight years old, Jess still holds a friendship she made in the region close to her heart. "My best friend to this day is Jess Elford, who I met in Kingaroy when I was 3 years old," she said. "For most of our friendship we haven't lived in the same town yet our friendship has stayed so strong. Jess, a proud Queenslander, moved from Kingaroy to Toowoomba in 2004, where she lived for seven years, before moving to Brisbane when she was 15. As she grew up, Jess liked to create videos of her singing for friends and family. "Ever since I was little I've been making videos, so I eventually made a YouTube channel to share videos I was making with my family and friends," she said. "I really wasn't aware of what you could do with YouTube, I didn't know about subscribers or making money - all I knew about was views. "So I uploaded videos, mostly covers of songs, onto YouTube simply to see how many of my family and friends had watched it." In 2014 Jess uploaded a video of her father playing a trombone and her brother using an oven door to keep the beat. The 'oven kid' video went viral and as of June 2017 has almost 12 million views. "That was really the first time my channel gained exposure and I was introduced properly to the world of YouTube," she said. "I remember hitting 2000 subscribers after the video went viral and I couldn't believe it, and that was when I decided to keep making videos and seeing how many people would follow along." Jess' online career grew from there, with her song covers and other video blogs amassing hundreds of thousands to millions of views. Her Instagram photos are seen by about 1.1 million followers. It was on the photo-sharing platform where she met her future husband, fellow YouTuber and Instagrammer Gabriel Conte. "I was making a trip out to Los Angeles in January 2016 and messaged him to ask what church he went to, because I was visiting for a month I wanted to visit a church while I was there," Jess said. "I knew he was a Christian too but since he had a lot of followers I never expected him to read it, let alone reply. "It was definitely all meant to be though, because he replied not too long after and we messaged on and off for about a month, but nothing too crazy - just small talk. "We decided to meet up when I got to LA, so he picked me up one Sunday morning and took me to church and lunch... I fell for him straight away." The couple, who post about their life on their joint YouTube channel Jess and Gabriel, were married on December 18, 2016 in Maleny, overlooking the Glass House Mountains. "It was perfect and so surreal," Jess said. "Long distance is so hard, and so knowing that after we left that chapel we would never have to say goodbye again was the most special feeling I've ever had. To this day I will never take that for granted. "The wedding was stunning. We had just over 100 guests, 15 to 20 of those being from America which was so great. The weather was a little rainy but it made the pictures so magical. It really was the best day ever." Following the wedding Jess moved to LA to live with Gabriel. "Something not many people know about me is that I had wanted to move to America ever since I was around 10 years old," she said. "A lot of people just thought it was a dream that would never happen, and it's so crazy to think that now I'm married to an American and living in LA. "It was fairly easy to know that Los Angeles was where Gabriel and I would live after getting married since that's where all of our work is. But who knows - maybe we'll move back to Australia one day." She said the move had been a bit of a culture shock. "It took so long to sink in that Los Angeles was now home and I would often get homesick," she said. "Some things felt so strange - I had to learn to drive from scratch again since they drive on the other side of the road and the other side of the car." Since moving, Jess has yet to return to Australia, though said she hoped to come back in September. "We are so excited, I have missed Australia so much and Caramello Koalas and Strawberry Freddo Frogs," she said. The YouTube channel Jess and Gabriel share also has about 1.3 million subscribers. "We've really had to learn where the line is with what we share online," Jess said. "Since we work from home and film so much of our lives, we needed to make sure to keep part of our personal life private. "There always needs to be a balance between your work life and personal life, so it's important to know when to turn the camera off and what days not to film on. Days like that are usually on significant days, like an anniversary, where we want the day to be just us, and not us thinking about filming and getting certain shots." While there are challenges, Jess said there were also many joys associated with sharing her life online. "It's such a blessing to have such a large online audience," she said. "We try our best to share a positive message online and to always be role models to our followers. "I also find it so cute when we get stopped when we are out and people tell us how inspiring our love story is for them. It's adorable that they know so many of our little personal jokes, even our secret handshake." For anyone around Kingaroy and Queensland who wanted to follow in Jess' footsteps, she said she encouraged people to be as genuine as they could online. "My advice would be to take it as organically as you can, and also to be patient," she said. "Gaining a lot of followers won't happen overnight, so make sure you stay true to who you are. People will be able to tell if you're being yourself online versus trying to be like someone else. "They will follow and love you for who you are. Be a positive influence and have fun." Despite her new life on the other side of the world Jess still holds her roots close to her. "I think the small town aspect of Kingaroy has always stuck with me," she said. "The community of a small town is so special and so different than how Los Angeles is. "I also still love country music, which I know came from my dad and Kingaroy." You can follow Jess on YouTube, Instagram and Facebook.